5/2 Cup of Coffee: On a rainy Sunday, just two of four scheduled games for Red Sox affiliates were played. Sean O'Sullivan pitched well for Pawtucket in a loss, and the Sea Dogs bullpen, along with Wendell Rijo's clutch hit, helped Portland secure a big extra-innings win. The PawSox bullpen was unable to hold a lead after the offense scored early, while Sean O'Sullivan delivered a nice outing. Blake Swihart got the scoring going with an RBI double in the first inning and later scored when Rusney Castillo reached on an error. Castillo would finish 2 for 5 with a double. Ryan LaMarre also had a nice day at the plate by going 2 for 5 with an RBI double. O'Sullivan lasted seven innings and left the game with a 4-2 lead. He struck out five and walked just one while allowing five hits. His ERA was lowered to 3.00 on the year. Wesley Wright gave up single runs in the eighth and ninth innings to send the game into extra innings. Kyle Martin took the loss by surrendering a walk-off single in the bottom of the 10th inning. Unlike the PawSox, the Sea Dogs made a late-inning surge for a comeback victory in 10 innings. Portland jumped out to a 3-1 lead after an inning, but trailed 5-3 entering the bottom of the ninth. 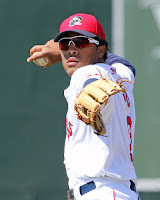 The inning had an interesting beginning, with Henry Ramos reaching second base after a dropped third strike. Reading continued to play sloppy baseball and the Sea Dogs took advantage, as Ramos scored when Wendell Rijo reached on an error. The tying run was driven in by Jordan Weems on a sacrifice fly. Rijo wasn't done, as he stroked a two-run walk-off double with two outs in the bottom of the 10th. He finished 4 for 5 with a walk, a double, two runs, and two RBI. Jordan Betts also knocked in a pair of runs. It was a rough outing for Kevin McAvoy, who lasted just 3 1/3 innings while allowing four earned runs on five hits. He struck out one and walked one. Mitch Atkins, Nik Turley, and Simon Mercedes combined to finish the game with 6 2/3 solid innings. Atkins allowed a run in four innings while striking out five, Turley gave up an unearned run in two innings with three punch outs, and Mercedes struck out the only two batters he faced. The final game of this series was rained out and will be made up sometime when the Pelicans come to Salem from June 1-3. The team announced that the exact date and time of the makeup game has yet to be determined. The Drive and BlueClaws already had a game scheduled for Monday, so the two teams will play a doubleheader tomorrow beginning at 4:35 p.m. Player of the Night: Wendell Rijo had been in a big time slump in his first year in Double-A. He entered the game 1 for his last 18, but broke out with a 4 for 5 game. He drove in a pair of runs, including the game-winnings runs, and also scored a pair of runs. He's now batting .219/.286/.344 on the year.